Is it okay to use logic to study God? [audio:http://www.truthrevolution.tv/show/TS-0313.mp3]No Flash Support? Use this Audio Player! Dave: What can logic do? Can it teach us anything about God? Jeff: Sure! 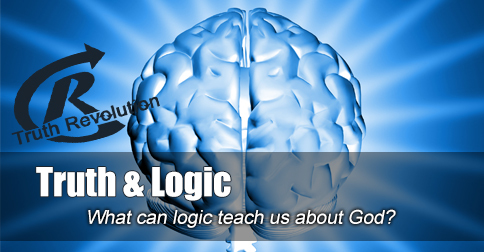 Logic can help lead us to a true knowledge of the creator and his creation. Jeff: Tough question, right? The obvious answer is “The Lord has” put wisdom inside of us! Dave: The Lord is the one who has given understanding to mankind. Jeff: So, it’s not ungodly to suggest that our brains can process information about Him. Dave: Through logic we are able to come to true conclusions about God and the world. Jeff: Now, logic is limited, ok? Logic can’t make any statements about the truth of a feeling. Dave: For example, the statement “The punch caused me pain” is a statement of logic; but logic cannot examine the pain itself. Nor can it make any assertions about the shout of “Ahh!” when the pain was felt. Truth Revolution is supported by listeners like you. Join our Truth Team right now! Watch Revolution Church LIVE ONLINE! Every Sunday.